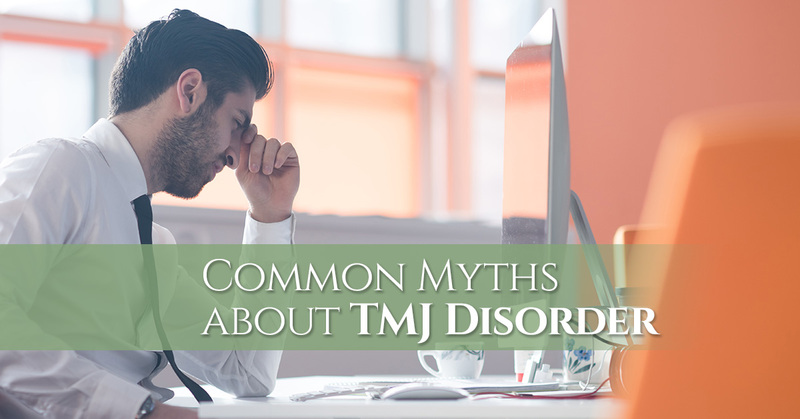 It’s time to get the facts straight about common TMJ (temporomandibular joint) disorder myths. Myth #1. TMJ disorder in all sufferers has a single cause. TMJ disorder can actually be caused by a number of different things, including whiplash and other injuries or trauma, a misaligned bite, bruxism, stress, rheumatoid arthritis and osteoarthritis. Because so many different things can cause TMJ disorder, it doesn’t always get properly diagnosed. If you think that you might be living with undiagnosed TMJ disorder, please don’t hesitate to schedule an appointment with our dentist at James Otten Dentistry. Myth #2. Migraines and TMJ headaches are the same things. There are so many different types of headaches — some originate in the head or the brain, like a migraine, while others originate in the neck or joints. TMJ headaches can be incredibly painful, and many people confuse them with migraines, but they originate in a very different way. TMJ headaches result from a muscle contraction in the neck, jaw or other trigger areas. Finding an effective treatment for your TMJ disorder can help you find relief from the pain associated with it, including TMJ headaches. Myth #3. The only treatment option you have for TMJ disorder is surgery. If you’ve been suffering through the pain caused by your TMJ disorder because you don’t want to have to undergo surgery to get the treatment you need, you’ll be glad to know that you have many treatment options at your disposal. Chiropractic care, stress management, certain medications and changes in diet are all possible treatment options for your TMJ disorder. At James Otten Dentistry, we offer TMJ treatment through dental devices. These devices are designed to help you achieve balance in your jaw, which helps to relieve pain. If you’re looking for a more long-term treatment option, we can also rebuild or reposition your teeth through dental restorations. Over 10 million Americans suffer from TMJ disorder, but there are many myths and misconceptions out there surrounding it. Don’t let these myths hold you back from getting the effective treatment you need for your TMJ disorder. The fact is that there are treatment options out there that work, and our dentist can help you find the best option for you. Contact us today to learn more!